Tottenham face a battle to remain in the Europa League after being held to a round of 32 first-leg draw by Fiorentina at White Hart Lane. Roberto Soldado volleyed in a sixth-minute opener from Paulinho’s corner as Spurs dominated the opening half-hour. But Argentina centre-back Jose Maria Basanta scrambled in an away goal that gives Vincenzo Montella’s side the edge ahead of next week’s second leg. Nacer Chadli hit the bar for Spurs, who faded after half-time. Celtic have been drawn against Inter Milan in the last 32 of the Europa League, with Liverpool facing Turkish side Besiktas. Tottenham play Serie A side Fiorentina, Everton face Swiss club Young Boys, while holders Sevilla are up against Borussia Monchengladbach. The two legs will be played on 19 and 26 February 2015. 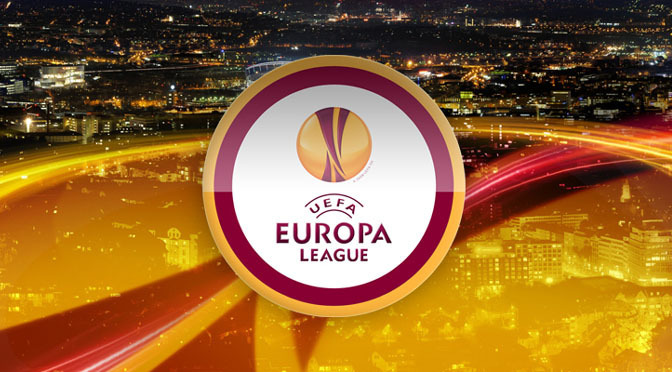 This season’s Europa League winners will qualify for next year’s Champions League play-offs. Celtic’s tie against Inter Milan is a repeat of the 1967 European Cup final in Lisbon, which the Glasgow side won 2-1 to become Britain’s first European champions. Inter, who appointed former Manchester City boss Roberto Mancini as their manager for a second time in November, are 12th in Italy’s top flight. 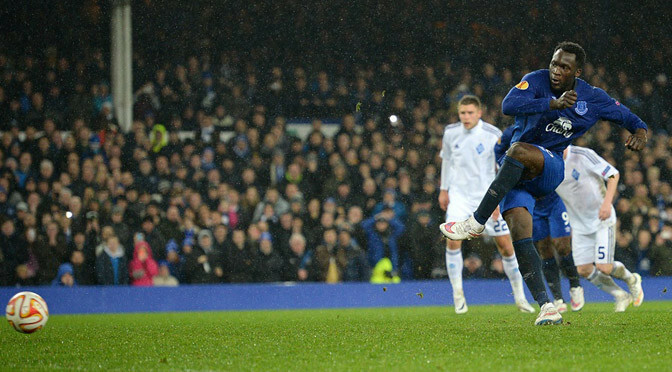 Tottenham could come up against England defender Micah Richards, who is on loan at Fiorentina from City. It is a first meeting between the London and Florence clubs. 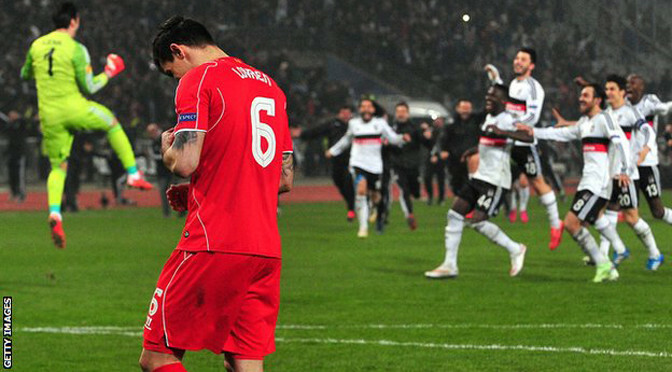 Liverpool, who entered the Europa League after finishing third in their Champions League group behind Real Madrid and Basle, last played Besiktas in the 2007/8 season, winning 8-0 at Anfield. 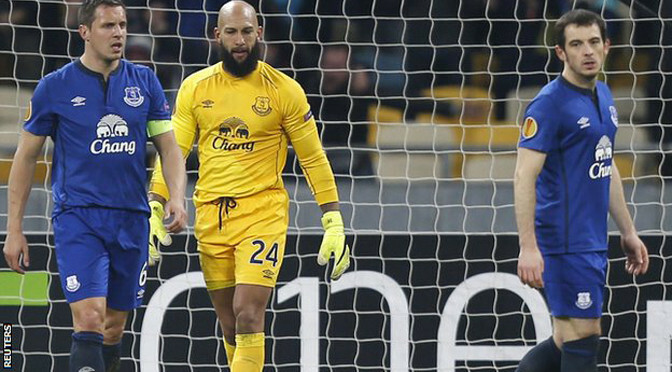 Everton have never faced Young Boys before. Tottenham manager Mauricio Pochettino bemoaned two “laughable” stoppages due to floodlight failure as his side slipped to a decisive defeat against Besiktas. The 1-0 loss relegated Spurs to second place in their Europa League group and means they face a tougher draw in the next round. Pochettino described the stoppages as “difficult to explain”, adding: “We had a chat with the referee and you need to accept the situation. Spurs dominated the first period, with Nacer Chadli having a goal ruled out and Roberto Soldado missing an excellent chance. 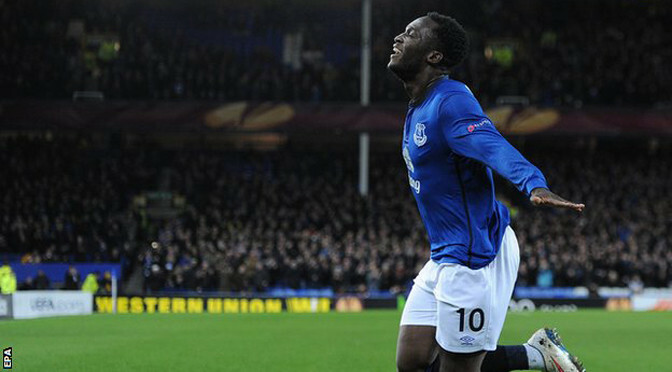 But the hosts improved in the second half and Cenk Tosun scored the decisive goal from Olcay Sahan’s low cross. It was the second straight Europa League match in which Spurs have had to contend with temporary abandonments, after their game against Partizan was halted three times due to pitch invasions. On that occasion, Tottenham kept their composure to win, but in Istanbul they could not find the goals needed to retain their advantage at the top of the group. It means they could face one of the Europa League group winners or seeded Champions League teams in the next round – including Zenit St Petersburg, managed by former Spurs boss Andre Villas-Boas. 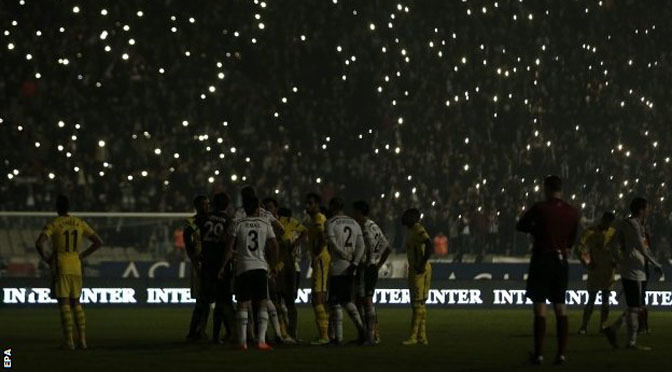 The game was first disrupted after eight minutes – with fans creating an improvised illumination with their smartphones during the ensuing stoppage. When the players returned to the pitch, Spurs – who welcomed back defender Kyle Walker after nine months out with an abdominal injury – seized the ascendancy and fashioned several good chances. Soldado spurned a golden opportunity when he scuffed a Younes Kaboul knockdown straight at Tolga Zengin, before Nacer Chadli was denied a goal due to a marginal, but correct offside decision. Besiktas were missing leading goalscorer Demba Ba through injury and they appeared toothless during the first half, but after the interval their back-up strikers proved their worth. Tosun thundered a superb effort against the crossbar but Mauricio Pochettino’s side did not heed the warning and two minutes later they were behind. From Gokhan Tore’s cross, Sahan knocked the ball across the six-yard box and Tosun converted. Former Fulham winger Kerim Frei then wasted a golden chance to settle the match, firing into the side netting after a superb one-two with Jose Sosa. The lights went out again after a minute of injury time, but Spurs could not find a crucial equaliser when the match briefly resumed.